Gatorade is a brand of sports drinks made by PepsiCo. Gatorade's G2 variety contains fewer calories than regular Gatorade. The Powerade brand of sports drinks is made by Coca-Cola and is the main competitor for Gatorade. Powerade Zero has electrolytes but no calories. G2 is essentially a mixture of water, high fructose corn syrup and electrolytes that provides sodium and potassium. Powerade Zero uses sucralose as a sweetener. Both drinks add coloring and flavor agents as appropriate for each drink. G2 is available in blueberry-pomegranate, fruit punch, grape, lemon-lime, orange and strawberry-kiwi flavors. Powerade Zero varieties include strawberry, mixed berry, grape, orange and lemon-lime. The nutritional information for both Gatorade G2 and Powerade Zero that follows is based on an 8 oz. serving. Both drinks are available in 20 oz. bottles, so a bottle contains 2 ½ servings. An 8 oz. 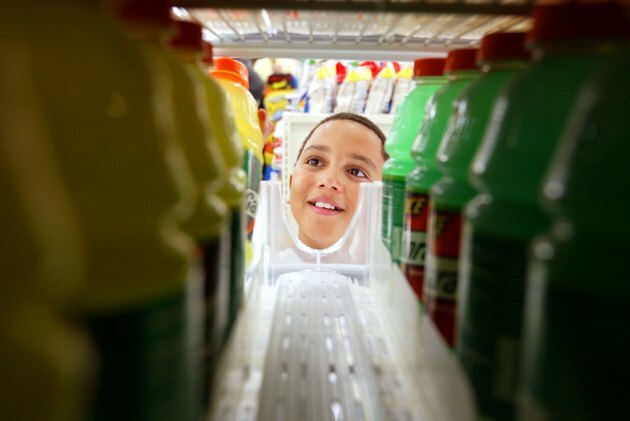 serving of Gatorade G2 has 28 calories, all of which comes from high fructose corn syrup. This represents 1.4 percent of the daily value (DV) in a diet of 2,000 calories. Powerade Zero has no calories, as sucralose is a calorie-free sweetener. A serving of Gatorade G2 has about 7 g of carbohydrates in the form of simple sugar. Each gram of simple sugar contains 4 calories, so a serving of Gatorade G2 has 7 x 4 = 28 calories. Powerade Zero has no carbohydrates, and neither drink contains fats or proteins. A serving of Gatorade G2 has 110 milligrams (mg) of sodium, or 4.8 percent of the DV for sodium. Powerade Zero contains 100 mg of sodium, which is 4.3 percent of the DV. A serving of Gatorade G2 also has 30 mg of potassium, while a serving of Powerade Zero has 25 mg of potassium. Both of these values are less than 1 percent of the DV for potassium. The regular versions of Gatorade and Powerade are similar to these low-calorie sports drinks except they contain higher concentrations of high fructose corn syrup. An 8 oz. serving of Gatorade's regular sports drink has 14 g of sugars, adding 56 calories. An 8 oz. serving of Powerade's regular sports drink has 15 g of sugars, adding 60 calories.